Mr. Martin Kreutner, Dean and Executive Secretary of IACA, emphasized the importance of regional collaboration in the fight against corruption at a high-level Economic Cooperation Organization (ECO) gathering in Baku, Azerbaijan earlier this week. In his remarks at the 3rd Meeting of the Heads of Anti-corruption Organizations and Ombudsmen of the ECO Member States on 6 June, Mr. Kreutner said effective links between countries can help in promoting anti-corruption activities, exchanging information, and elaborating best practices. He also pointed to the roles and responsibilities of ombudsmen and anti-corruption authorities to be sherpas for human rights in a world of increasing polarization, conflict, and distrust. 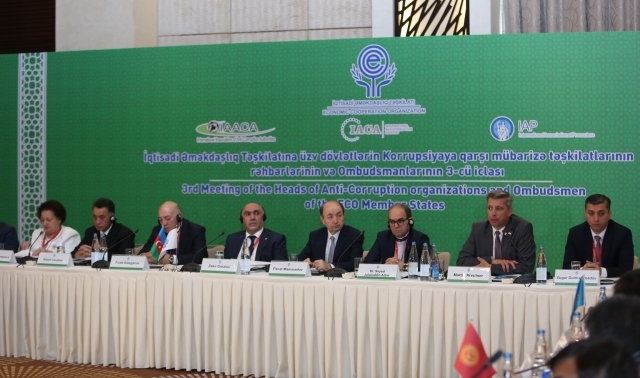 ECO is a Eurasian intergovernmental organization that aims to improve development and promote trade and investment opportunities among its ten Member States. Six of these are IACA Parties: Afghanistan, Azerbaijan, Kazakhstan, Kyrgyzstan, Pakistan, and Turkey. At the meeting senior officials from Member States’ anti-corruption agencies, ombudsmen, and prosecutors’ offices shared their experiences of cooperating with international and regional anti-corruption mechanisms and implementing preventive measures at national and regional levels. This year’s event was organized by the Republic of Azerbaijan and chaired by Mr. Zakir Garalov, Prosecutor General of the country. Prominent speakers from the host country also included Mr. Fikrat Mammadov, Minister of Justice, and Mr. Kamran Aliyev, Head of the Anti-Corruption Directorate and Vice President of the fifth session of IACA’s Assembly of Parties (AoP). Within the overall framework, the IACA delegation had bilateral meetings with Mr. Mammadov, the Deputy Secretary-General of ECO, and Heads of Delegation of participating States. Azerbaijan acceded to the Agreement for the Establishment of IACA as an International Organization in September 2012 and hosted the third session of the AoP in 2014.